North Korea has one of the largest conventional standing armies in the world, but much of its equipment is outdated and would be woefully inadequate against a direct force-to-force conflict with South Korea and the US. However, its 1.2 million person military isn't just made up of regular soldiers. Outside of the nuclear threat, the one area that has many military analysts concerned, is North Korea's asymmetric warfare capability. The country's Special Operations Force has around 180,000 troops that are highly trained, motivated, and specialize in infiltration, terrorism, urban combat, and other methods. There are four known urban combat training centers in North Korea, with an alleged fifth underground site somewhere around Pyongyang. On top of the urban combat sites, there's a further 23 large military training grounds. SOF training lasts 3-6 months and covers a very wide range of tactics. While the exact date the SOF was formed isn't known, it is clear they've been active since at least the 1960s. Between 1953 and 1999, the DPRK committed over 76,000 transgressions against the 1953 Armistice Treaty. Among those, we know that the SOF was used in the 1968 Blue House raid which was an unsuccessful assassination attempt on South Korea's then president Park Chung-hee and resulted in 30 ROK-US fatalities as well as the suicide of 29 of the North Korean operatives. There was also the 1983 Rangoon bombing in Burma (another assassination attempt) that resulted in 67 casualties. The largest of the urban combat centers is located 16 miles north-east of the Yongbyon nuclear site in North Pyongan Province. It has a full-scale downtown mock-up that's half a mile wide on each side. Here's a section of the "town" with the buildings arranged in rectangles. 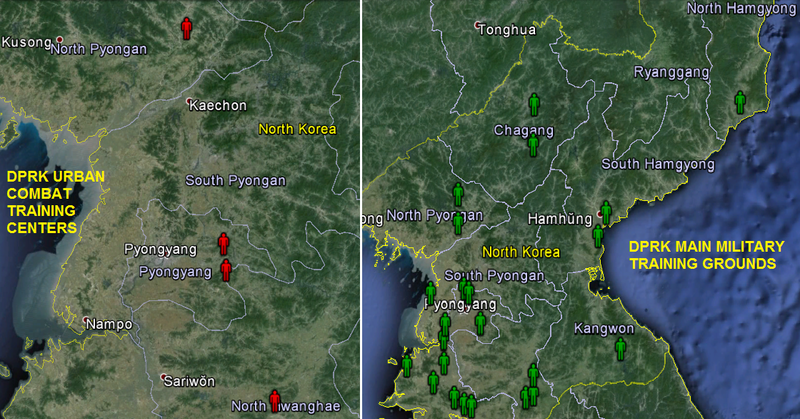 Pyongyang has two known urban warfare centers. Both of them are to the far east of the city center and are 8 miles apart (nearly in a straight north-south line). The southern base has buildings of a slightly more modern design, while the northern one is more traditional. The northern one is near the town of Kangdong, Pyongyang. There is also an alleged site in Pyongyang which is mentioned in Bradley Martin's book "Under the Care of the Fatherly Leader", and is described by defector Ahn Myung-jin as being underground near the country's primary espionage training complex and is supposedly dedicated to training spies and other special forces to infiltrate & attack Seoul. It has 8 kilometers of tunnels and is an exact small-scale replica, outfitted with operational stores, residences, government buildings, and even allows them to "buy" things in the stores so they can get used to the way of life in South Korea - before attempting to destroy the city. There are many underground facilities and tunnels in Pyongyang, but I haven't been able to find likely locations for such a compound. For a bit of international context, here is an urban combat facility in Fort Bragg, NC USA.